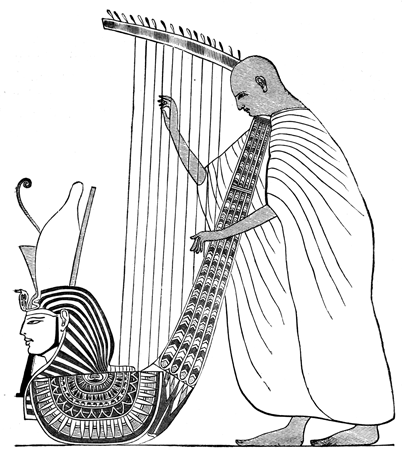 HARP-PLAYER. 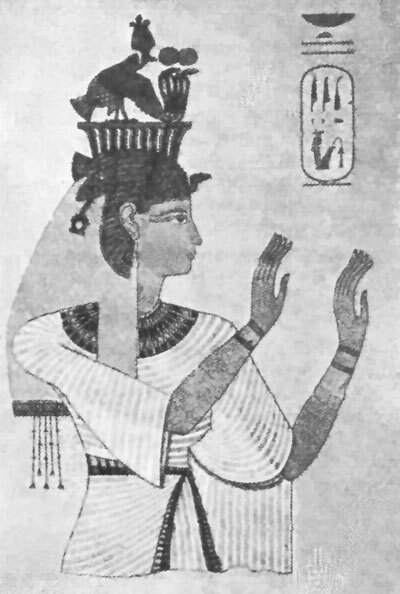 From an Egyptian painting. Egyptian painting is principally found on the walls of temples and tombs, upon columns and cornices, and on small articles found in burial places. There is no doubt that it was used as a decoration; but it was also intended to be useful, and was so employed as to tell the history of the country;--its wars, with their conquests and triumphs, and the lives of the kings, and many other stories, are just as distinctly told by pictures as by the hieroglyphics or Egyptian writings. 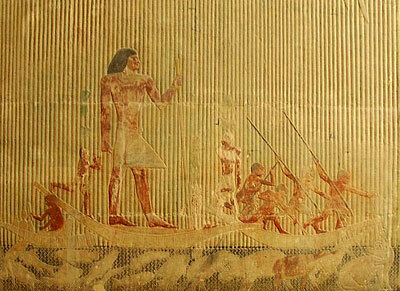 We can scarcely say that Egyptian painting is beautiful; but it certainly is very interesting. The Egyptians had three kinds of painting: one on flat surfaces, a second on bas-reliefs, or designs a little raised and then colored, and a third on designs in _intaglio_, or hollowed out from the flat surface and the colors applied to the figures thus cut out. They had no knowledge of what we call perspective, that is, the art of representing a variety of objects on one flat surface, and making them appear to be at different distances from us--and you will see from the illustrations given here that their drawing and their manner of expressing the meaning of what they painted were very crude. As far as the pictorial effect is concerned, there is very little difference between the three modes of Egyptian painting; their general appearance is very nearly the same. The Egyptian artist sacrificed everything to the one consideration of telling his story clearly; the way in which he did this was sometimes very amusing, such as the making one man twice as tall as another in order to signify that he was of high position, such as a king or an officer of high rank. When figures are represented as following each other, those that are behind are frequently taller than those in front, and sometimes those that are farthest back are ranged in rows, with the feet of one row entirely above the heads of the others. This illustration of the storming of a fort by a king and his sons will show you this. The sons are intended to be represented as following the father, and are in a row, one above the other (Fig. 2). For the representation of water, a strip of blue filled in with perpendicular zigzag black lines was used. From these few facts you can understand how unformed and awkward Egyptian pictures seem if we compare them with the existing idea of what is beautiful. There appear to have been certain fixed rules for the use of colors, and certain objects were always painted in the colors prescribed for them. 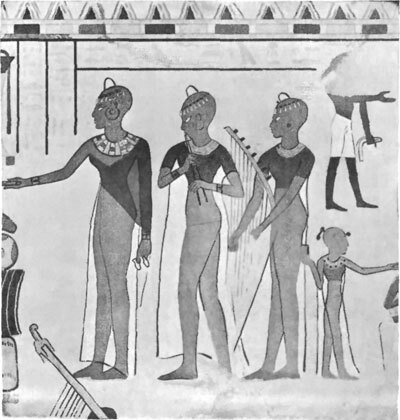 The background of a picture was always of a single, solid color; Egyptian men were painted in a reddish brown, and horses were of the same shade; women were generally yellow, sometimes a lighter brown than the men; negroes were black, the Asiatic races yellow, and but one instance is known of a white skin, blue eyes, and yellow hair. The draperies about the figures were painted in pleasing colors, and were sometimes transparent, so that the figures could be seen through them. 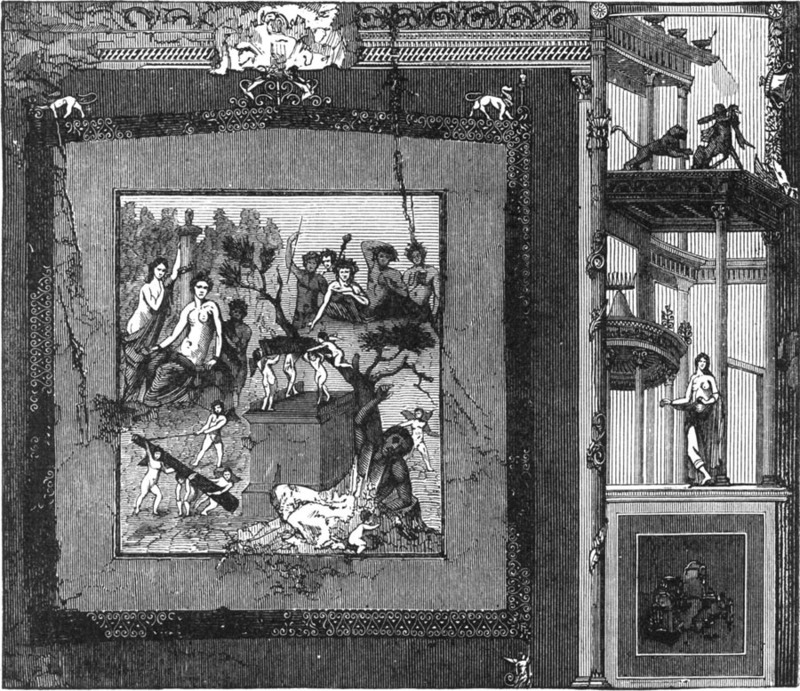 The execution of Egyptian paintings was very mechanical. One set of workmen prepared the plaster on the wall for the reception of the colors; another set drew all the outlines in red; then, if chiselling was to be done, another class performed this labor; and, finally, still others put on the colors. Of course nothing could be more matter-of-fact than such painting as this, and under such rules an artist of the most lofty genius and imagination would find it impossible to express his conceptions in his work. We know all this because some of these pictures exist in an unfinished condition, and are left in the various stages of execution; then, too, there are other pictures of the painters at their work, and all these different processes are shown in them. The outline drawing is the best part of Egyptian painting, and this is frequently very cleverly done. The painting of Greece and that of ancient Italy are so much the same that it is almost impossible to speak of them separately; the art of painting was carried from Greece to Italy by the Etruscans, and the art of ancient Rome was simply that of Greece transplanted. If Greek artists were employed by Romans, certainly their works were Greek; and if Romans painted they aimed to imitate the Greeks exactly, so that Italian painting before the time of the Christian era must be considered together with that of Greece. In architecture and sculpture the ancient Greeks accepted what had been done by the Egyptians and Assyrians as a foundation, and went on to perfect the work of the older nations through the aid of poetic and artistic imaginations. But in painting the Greeks followed nothing that had preceded them. They were the first to make pictures which were a life-like reproduction of what they saw about them: they were the first to separate painting from sculpture, and to give it such importance as would permit it to have its own place, quite free from the influence of any other art, and in its own way as grand and as beautiful as its sister arts. 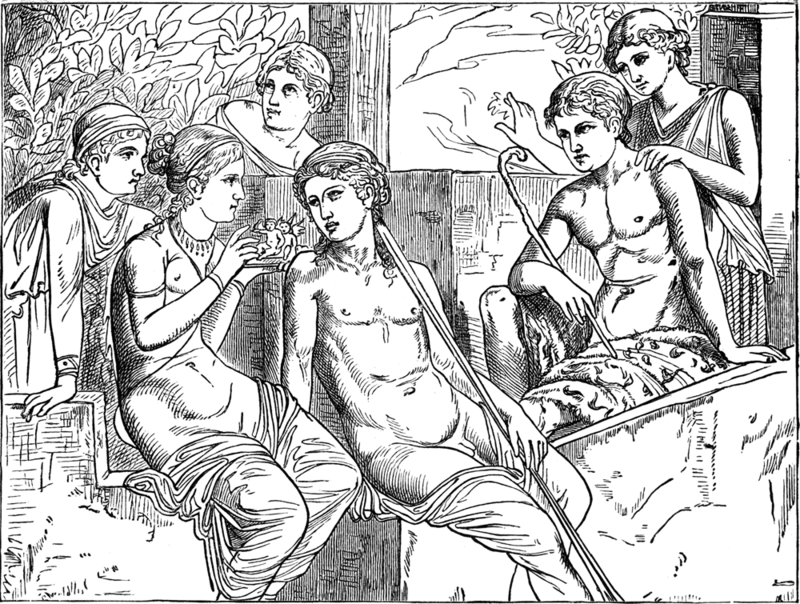 Apollodorus, an Athenian who lived at about the close of the fifth century B. was the first one who knew how to make his pictures appear to be real, and to follow the rules of perspective so as to have a background from which his figures stood out, and to shade his colors and soften his outlines. He was very famous, and was called _skiagraphos_, which means shadow painter. The works of the ancient painters which still remain in various countries are wall-paintings, paintings on vases, mosaics, paintings on stone, and certain so-called miniatures; and besides these principal works there are many small articles, such as mirrors, toilet-cases, and other useful objects, which are decorated in colors. Murals, or wall-paintings, are the most important and interesting remains of ancient painting. The Etruscan tombs which have been opened contain many beautiful objects of various kinds, and were frequently decorated with mural pictures. They often consist of several rooms, and have the appearance of being prepared as a home for the living rather than for the dead. Fig. 5 is in a tomb known as the Grotta della Querciola. The upper part represents a feast, and the lower portion a boar-hunt in a wood, which is indicated by the few trees and the little twigs which are intended to represent the underbrush of the forest. If we compare these pictures with the works of the best Italian masters, they seem very crude and almost childish in their simplicity; but, if we contrast them with the paintings of the Egyptians, we see that a great advance has been made since the earliest paintings of which we know were done. The pose and action of the figures and their grace of movement, as well as the folding of the draperies, are far better than anything earlier than the Greek painting of which there is any knowledge; for, as we have said, these Etruscan works are essentially Greek. Fig. 6 belongs to a later period than the other, and is taken from a tomb at Vulci which was opened in 1857 by François. This tomb has seven different chambers, several of which are decorated with wall-paintings of mythological subjects. A square chamber at the end of the tomb has the most important pictures. On one side the human sacrifices which were customary at Etruscan funerals are represented: the pictures are very painful, and the terror and agony of the poor victims who are being put to death make them really repulsive to see. On an opposite wall is the painting from which our cut is taken. This represents the sacrifices made before Troy by Achilles, on account of the death of his dear friend Patroklos. 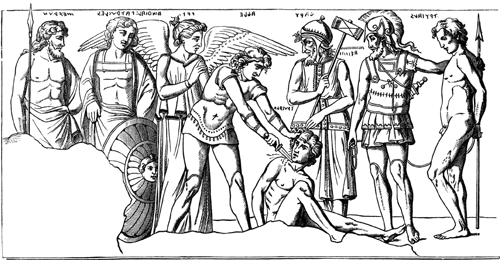 The figure with the hammer is Charon, who stands ready to receive the sacrifice which is intended to win his favor. Your mythology will tell you the story, which is too long to be given here. The realism of this picture is shocking in its effect, and yet there is something about the manner of the drawing and the arrangement of the whole design that fixes our attention even while it makes us shudder. 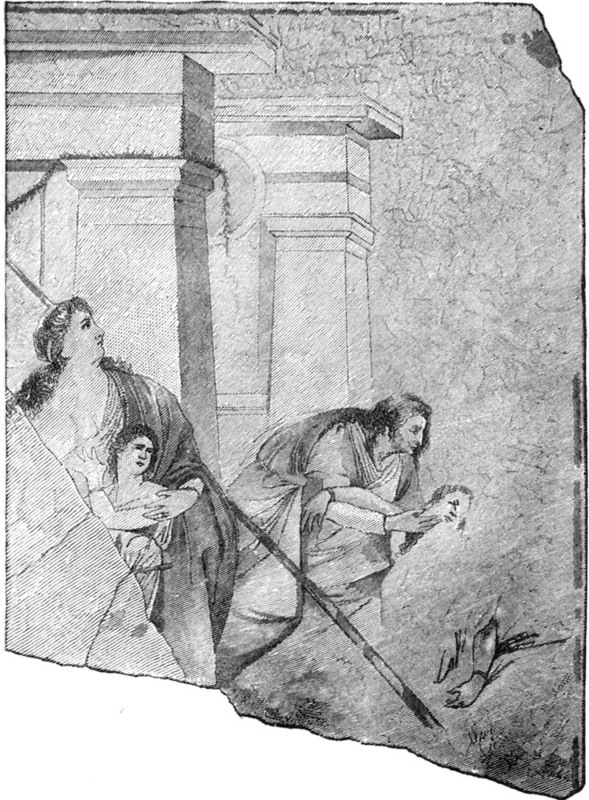 The ancient wall-paintings which have been found in Rome are far more varied than are those of Etruria; for, while some of the Roman pictures are found in tombs, others are taken from baths, palaces, and villas. They generally belong to one period, and that is about the close of the Republic and the beginning of the Empire. Modern excavations have revealed many of these ancient paintings; but so many of them crumble and fade away so soon after they are exposed to the air, that few remain in a condition to afford any satisfaction in seeing them. But fortunately drawings have been made of nearly all these pictures before they fell into decay. FIG. 7.--THE ALDOBRANDINI MARRIAGE. From a wall-painting in the Vatican. Some of the ancient paintings have been carefully removed from the walls where they were found, and placed in museums and other collections. One of the finest of these is in the Vatican, and is called the Aldobrandini Marriage. It received this name from the fact that Cardinal Aldobrandini was its first possessor after its discovery, near the Arch of Gallienus, in 1606. As you will see from Fig. 7, from it, there are three distinct groups represented. In the centre the bride veiled, with her head modestly bowed down, is seated on a couch with a woman beside her who seems to be arranging some part of her toilet, while another stands near holding ointment and a bowl. At the head of the couch the bridegroom is seated on a threshold. The upper part of his figure is bare, and he has a garland upon his head. On the right of the picture an ante-room is represented in which are three women with musical instruments, singing sacrificial songs. To the left, in another apartment, three other women are preparing a bath. This is charming on account of the sweet, serious way in which the whole story is placed before us; but as a painting it is an inferior work of art--not in the least above the style which we should call house decoration. Although ancient writers had spoken of landscape paintings, it was not until 1848-1850, when a series of them was discovered on the Esquiline in Rome, that any very satisfactory specimens could be shown. These pictures number eight: six are complete, of the seventh but half remains, and the eighth is in a very imperfect state. They may be called historical landscapes, because each one has a complete landscape as well as figures which tell a story. They illustrate certain passages from the Odyssey of Homer. The one from which our cut is taken shows the visit of Ulysses to the lower world. When on the wall the pictures were divided by pilasters, and finished at the top by a border or frieze. The pilasters are bright red, and the chief colors in the picture are a yellowish brown and a greenish blue. In this scene the way in which the light streams through the entrance to the lower world is very striking, and shows the many figures there with the best possible effect. Even those in the far distance on the right are distinctly seen. This collection of Esquiline wall-paintings is now in the Vatican Library. Besides the ancient mural paintings which have been placed in the museums of Rome, there are others which still remain where they were painted, in palaces, villas, and tombs. 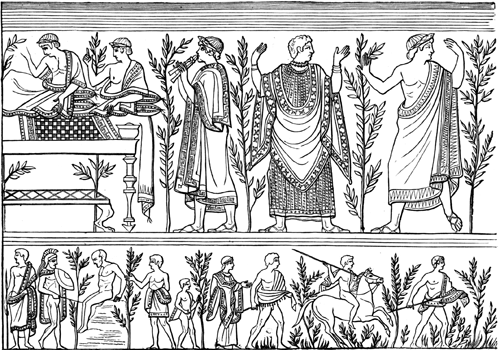 Perhaps those in the house of Livia are the most interesting; they represent mythological stories, and one frieze has different scenes of street life in an ancient town. Though these decorations are done in a mechanical sort of painting, such as is practised by the ordinary fresco painters of our own time, yet there was sufficient artistic feeling in their authors to prevent their repeating any one design. 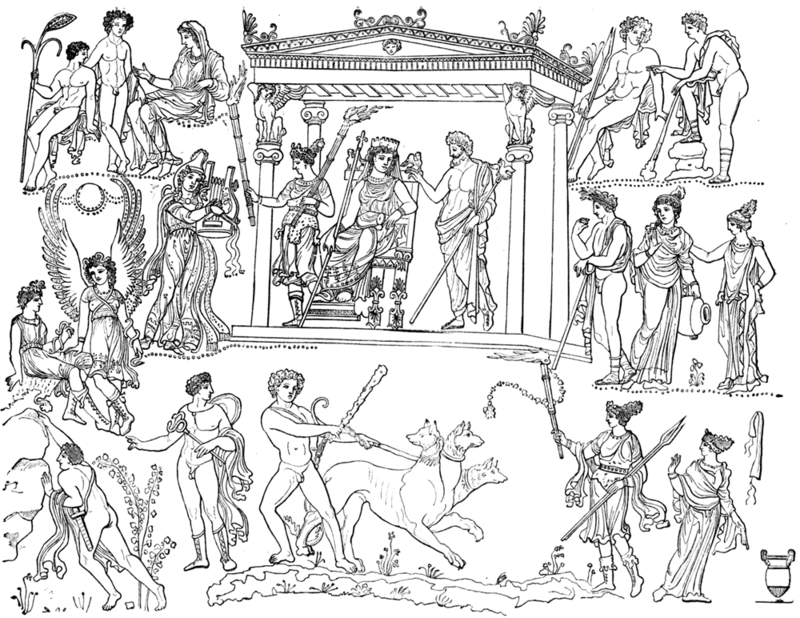 The variety of subjects at Pompeii is large: there are landscapes, hunting scenes, mythological subjects, numerous kinds of single figures, such as dancing girls, the hours, or seasons, graces, satyrs, and many others; devotional pictures, such as representations of the ancient divinities, lares, penates, and genii; pictures of tavern scenes, of mechanics at their work; rope-dancers and representations of various games, gladiatorial contests, _genre_ scenes from the lives of children, youths, and women, festival ceremonies, actors, poets, and stage scenes, and last, but not least, many caricatures, of which here is an example (Fig. 9). 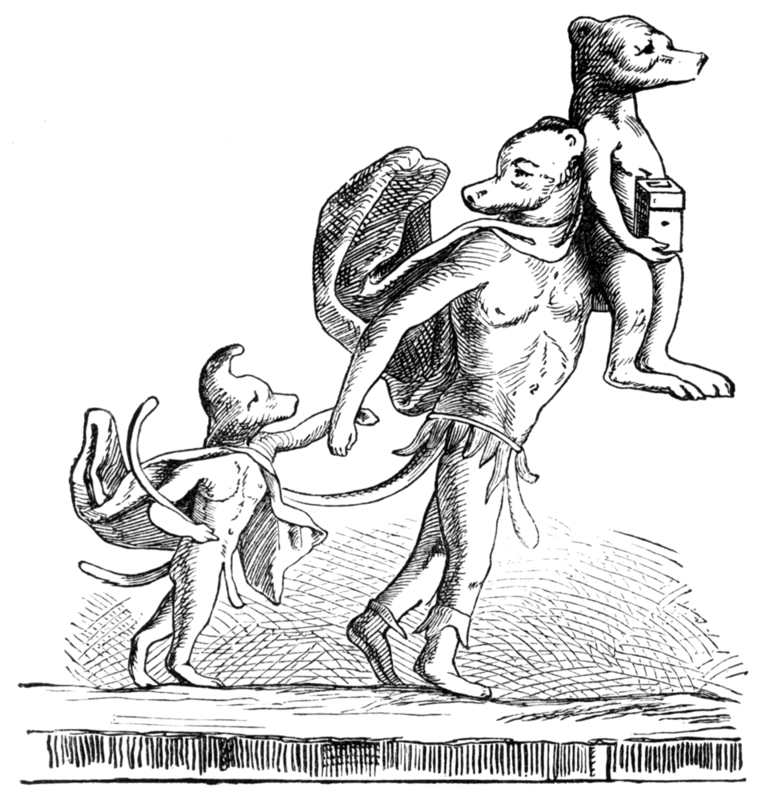 The largest dog is Æneas, who leads the little Ascanius by the hand and carries his father, Anchises, on his shoulder. Frequently in the ancient caricatures monkeys are made to take the part of historical and imaginary heroes. Fig. 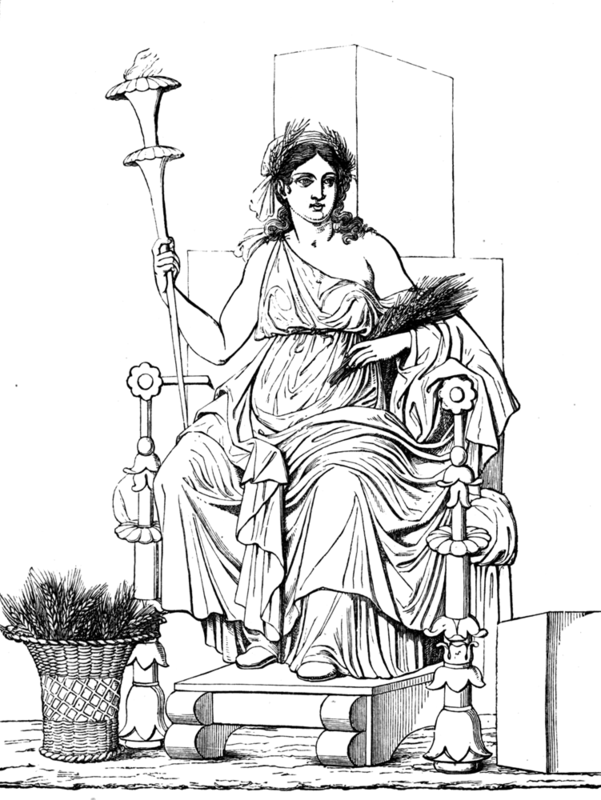 10, of Demeter, or Ceres, enthroned is an example of such devotional paintings as were placed above the altars and shrines for private worship in the houses of Pompeii, or at the street corners, just as we now see pictures and sacred figures in street shrines in Roman Catholic countries. In ancient days, as now, these pictures were often done in a coarse and careless manner, as if religious use, and not art, was the object in the mind of the artist. Fig. 11 shows you how these painted walls were sometimes divided; the principal subjects were surrounded by ornamental borders, and the spaces between filled in with all sorts of little compartments. The small spaces in this picture are quite regular in form; but frequently they are of varied shapes, and give a very decorative effect to the whole work. The colors used upon these different panels, as they may be called, were usually red, yellow, black, and white--more rarely blue and green. Sometimes the entire decoration consisted of these small, variously colored spaces, divided by some graceful little border, with a very small figure, plant, or other object in the centre of each space. Fig. 12, of a Nest of Cupids is a very interesting example of Pompeian painting, and more nearly resembles pictures of later times than does any other ancient painting . The pictures known as mosaics are made by fitting together bits of marble, stone, or glass of different colors and so arranging them as to represent figures and objects of various kinds, so that at a distance they have much the same effect as that of pictures painted with brush and colors. The art of making mosaics is very ancient, and was probably invented in the East, where it was used for borders and other decorations in regular set patterns. It was not until after the time of Alexander the Great that the Greeks used this process for making pictures. At first, too, mosaics were used for floors or pavements only, and the designs in them were somewhat like those of the tile pavements of our own time. This picture of doves will give you a good idea of a mosaic; this subject is a very interesting one, because it is said to have been first made by Sosos in Pergamos. It was often repeated in later days, and that from which our cut is taken was found in the ruins of Hadrian’s villa at Tivoli, near Rome; it is known as the Capitoline Doves, from the fact that it is now in the Capitoline Museum in Rome. Few works of ancient art are more admired and as frequently copied as this mosaic: it is not unusual to see ladies wear brooches with this design in fine mosaic work. Fig. 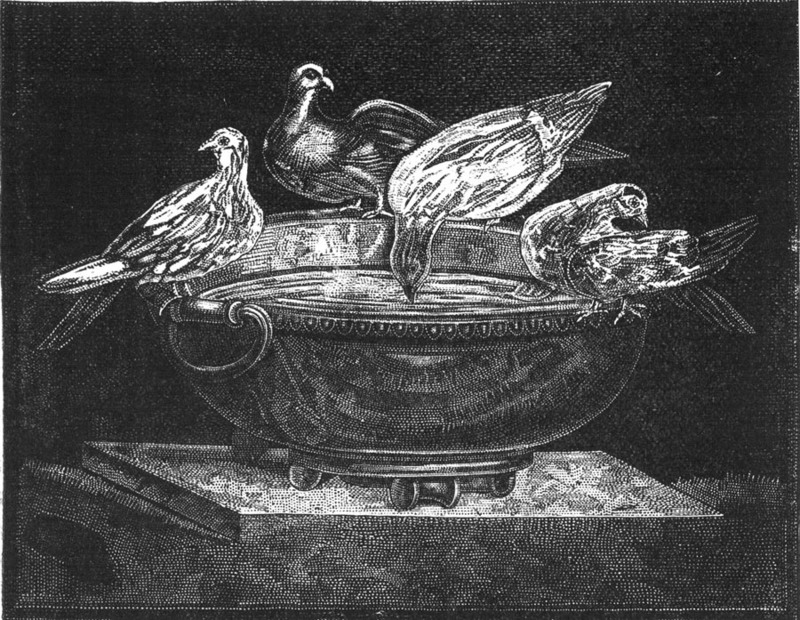 13.—Doves Seated on a Bowl. From a mosaic picture in the Capitol, Rome. A few examples of ancient mosaics which were used for wall decorations have been found; they may almost be said not to exceed a dozen; but pavement mosaics are very numerous, and are still seen in the places for which they were designed and where they have been during many centuries, as well as in museums to which they have been removed. They are so hard in outline and so mechanical in every way that they are not very attractive if we think of them as pictures, and their chief interest is in the skill and patience with which mosaic workers combine the numberless particles of one substance and another which go to make up the whole. Mosaic pictures, as a rule, are not large; but one found at Palestrina, which is called the Nile mosaic, is six by five metres inside. Its subject is the inundation of a village on the river Nile. 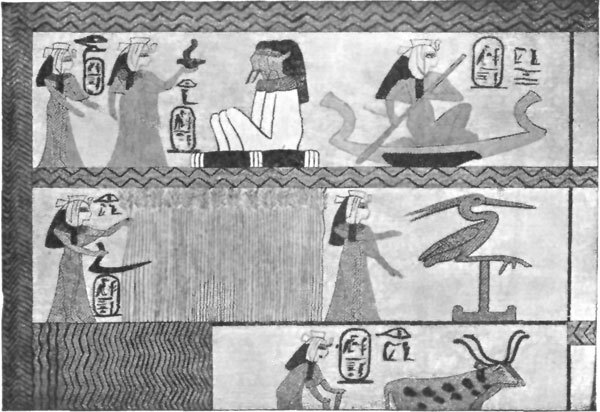 There are an immense number of figures and a variety of scenes in it; there are Egyptians hunting the Nile horse, a party of revellers in a bower draped with vines, bands of warriors and other groups of men occupied in different pursuits, and all represented at the season when the Nile overflows its banks. This is a very remarkable work, and it has been proved that a portion of the original is in the Berlin Museum, and has been replaced by a copy at Palestrina. It is well known that much of the decoration of Greek edifices was in colors. Of course these paintings were put upon the marble and stone of which the structures were made. The Greeks also made small pictures and painted them on stone, just as canvas and panels of wood are now used. Such painted slabs have been found in Herculaneum, in Corneto, and in different Etruscan tombs; but the most important and satisfactory one was found at Pompeii in 1872. Since then the colors have almost vanished; but Fig. 14, from it, will show you how it appeared when found. It represents the mythological story of the punishment of Niobe, and is very beautiful in its design. 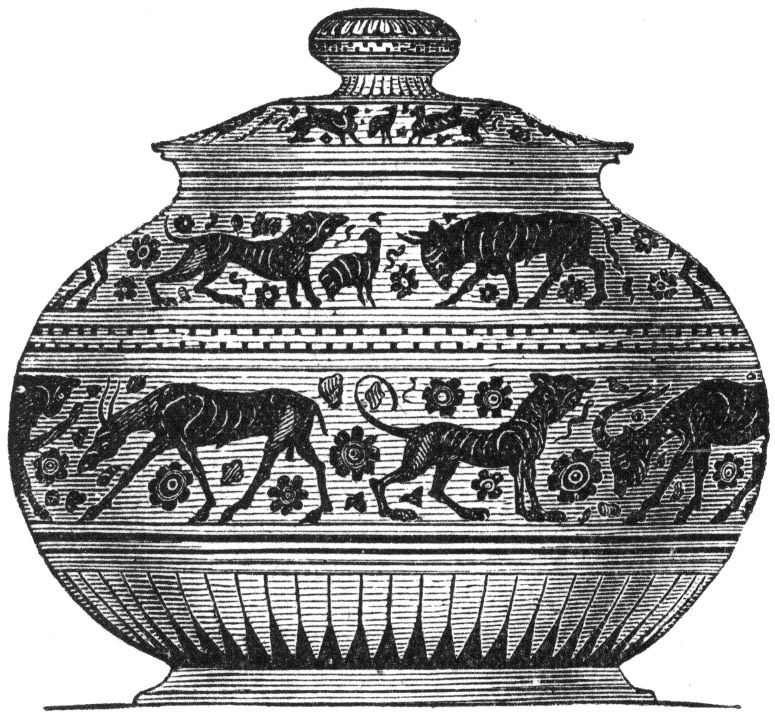 Vase-painting was another art very much practised by the ancients. So much can be said of it that it would require more space than we can give for its history even in outline. So I shall only say that it fills an important place in historic art, because from the thousands of ancient vases that have been found in one country and another, much has been learned concerning the history of these lands and the manners and customs of their people; occasionally inscriptions are found upon decorated vases which are of great value to scholars who study the history of the past. Fig. 14.—Niobe. From a picture on a slab of granite at Pompeii. Fig. 15.—The Dodwell Vase. At Munich. The Dodwell vase shows you the more simple style of decoration which was used in the earlier times. Gradually the designs came to be more and more elaborate, until whole stories were as distinctly told by the pictures on vases as if they had been written out in books. The next cut, which is made from a vase-painting, will show what I mean. The subject of Fig. 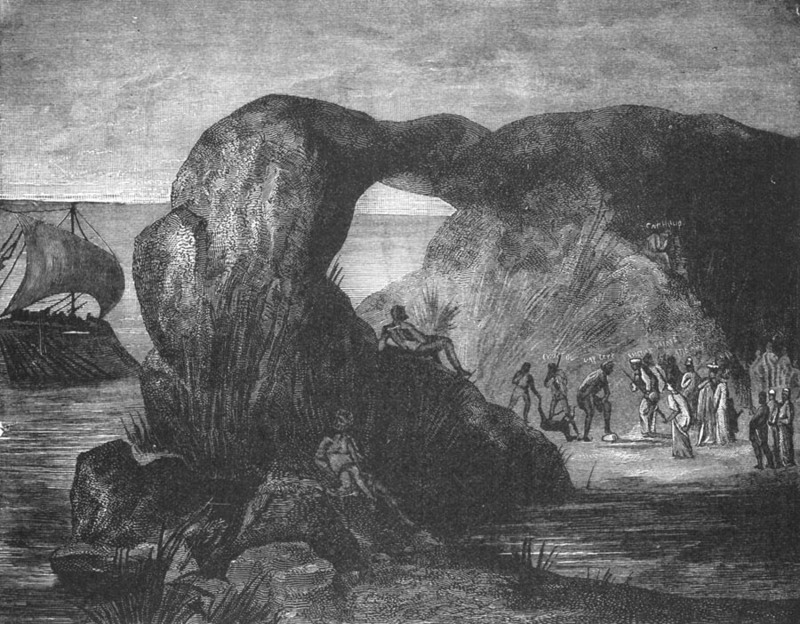 16 is connected with the service of the dead, and shows a scene in the under world, such as accorded with ancient religious notions. In the upper portion the friends of the deceased are grouped around a little temple. Scholars trace the manufacture of these vases back to very ancient days, and down to its decline, about two centuries before Christ. I do not mean that vase-painting ceased then, for its latest traces come down to 65 b.c. ; but like all other ancient arts, it was then in a state of decadence. Though vase-painting was one of the lesser arts, its importance can scarcely be overestimated, and it fully merits the devoted study and admiration which it receives from those who are learned in its history. Fig. 16.—Scene in the Lower World. From a vase of the style of Lower Italy.